In this issue: pointy-eared barbarians, elf children, a pioneer planet—and the July contest. The Hradani barbarian has come a long way as the War God’s champion, but his ascension to Wind Rider has brought him some powerful enemies—and an equally perilous and alarming chance for dangerous liaisons with Baron Tellian’s daughter, the heir to the mighty Sothoii realm. Pittsburgh, PA: magically transported to a world of elves and magic. Now Tinker, once a downtrodden waif from that city, but lately a full-blooded elf ruler, must root out and destroy an evil plot that involves the kidnapping and breeding of elf children. Sequel to Tinker and Wolf Who Rules. Your planet. Your rules. Earn free ebooks. Stake your claim on Planet Baen, the Facebook integrated game. Build a settlement on a pioneer planet and earn free ebooks of your choice from Baenebooks.com. Sign up and play today! You photoshop enthusiasts out there: have we got a contest for you! 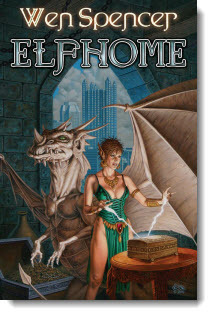 In celebration of July fantasy offerings Elfhome and War Maid’s Choice this month, we challenge you to create your version of an elf warrior. Can be male or female, but should be tough as nails and otherworldly at the same time. We also have to insist that these be kept in the PG to PG-13 range for the contest and for the sake of elven modesty. The Hradani barbarian has come a long way as the War God’s champion, but his ascension to Wind Rider has brought him some powerful enemies—and an equally perilous and alarming chance for dangerous liaison with Baron Tellian’s daughter, the heir to the mighty Sothoii realm. 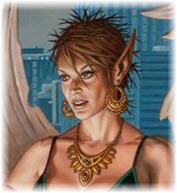 Tinker, once a downtrodden waif from Pittsburgh, but lately a full-blooded elf ruler, must root out and destroy an evil plot that involves the kidnapping and breeding of elf children. Masterful speculative tales on what makes us human – and the problems, opportunities, and adventures humans must face in order to win a superhuman future. 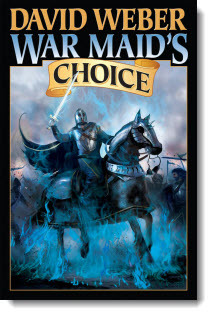 First entry in a new fantasy-alternate history series from S.M. Stirling, John Ringo & Jody Lynn Nye, Harry Turtledove, and Michael Z. Williamson. After the extinction asteroid doesn’t strike Earth, dinosaurs and mammals strive for dominance. In a heroic, bronze-age world, the Mrem Clan of the Claw expands its rough-and-tumble territory. When the werewolf cubs and the baby vamps are tucked away, the adults come out to play. Best-sellers Tanya Huff, Caitlin Kittredge and Toni L.P. Kelner join Sarah Hoyt, Diana Rowland and editor Mark L. Van Name to create a dazzling cast of vampires, werewolves, witches and zombies, oh my. Oh my. 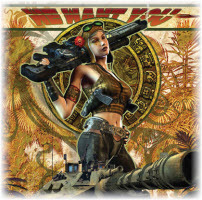 Don't forget to check out the latest Ebook releases, and Baen.com free fiction and articles including the origin story of the Planet Baen game, “The Conquest of Planet Baen” here, and “Taking the High Road,” the winner of the annual Jim Baen Memorial contest for forward-looking science fiction here.